I couldn't find that NCAA transfer Rule anywhere on the NCAA transfer rules site. I am with you. I have seen a lot in terms of transfers and such, but I don't recall them working with a new coach on their way out the door. Still wearing Maine gear I understand because it was free and that is what they have. They are still going to have access to the facilities to lift weights and shoot in the gym because most coaches (Barron and his religious background and religious coaching staff he assembled especially) won't just cut a kid off because it is unprofessional and it is a courtesy to the kids to allow them to work. It to do It with the current coach and the remaining team members? That is bizarre at best. 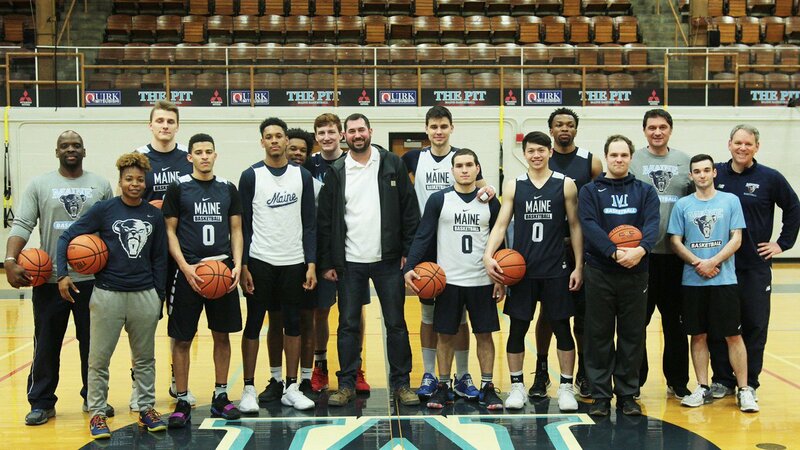 I honestly thought that it was an April Fools photo shop job until I saw that it was a tweet from the official Maine mens basketball Twitter account. So my question now is....are these guys transferring or not??? If they are....can they get it over with so we can all move on? "mainejeff": Good question!! 4 of the 5 are scholarship players and with 1 verbal commit that I guess that officially or unofficially which ever it is leaves just 1 scholarship available at the moment . Even if verbalcommit.com states they have 5 available because they have 7 returning scholarship players and Moss the verbal commit. Maybe the Fab 4 transfers can be "special guests" at next season's first practice....that is if their new coaches at new schools will allow them to. I'm feeling queazy about this program right now. mainejeff wrote: Maybe the Fab 4 transfers can be "special guests" at next season's first practice....that is if their new coaches at new schools will allow them to. "mainejeff": I can understand you might need some rolaids. In my Tuesday, March 13th, "Off the Rim" column in the BDN I listed 6 challenges that I thought the new UMaine men's basketball coach faced. He completed the first challenge by naming his coaching staff officially on March 29th after being named the head coach on March 5th. He currently is into the stage of the second challenge of recruiting to replace the 1 senior scholarship player, 1 walk on senior and the 4 scholarship transfers and 1 walk on transfer. The 3rd challenge is going on while the recruiting challenge is going on which is not to lose any more of the better 7 scholarship players remaining so far to the "transfer bug". However, did lose the 6'7" Jonathan Komagum one of two verbal commits on April 7th. Interesting article in BDN online sports and probably in paper Wednesday, April 11th on why 6'7" Jonathan Komagum de-commited and Tom@mbr will probably have it here on MBR in the A.M. ...The high school senior at TaylorMade Academy in Pensacola, Florida, made his decision after visiting the Orono campus April 5-7. Black Bear alum Joe Campbell '05 stopped by the Pit today for practice! Ahhh....another picture. Now we are down to 2 "transfers" participating in an official team practice with Ashley & Bryant (peek-a-boo behind White). What the heck....may as well keep them in playing shape for their next stop....right? Jeff, Maybe the other guys were in class. They probably shouldn't miss out on these great opportunities to meet former Black Bears. Next time they should skip class. I know that I need to get off their case....but this is not a good look.